If you are an electronic engineer or received an education in electronics that went beyond the very basics, there is a good chance that you will be familiar with the Fairchild μA723. This chip designed by the legendary Bob Widlar and released in 1967 is a kit-of-parts for building all sorts of voltage regulators. Aside from being a very useful device, it may owe some of its long life to appearing as a teaching example in Paul Horowitz and Winfield Hill’s seminal text, The Art Of Electronics. It’s a favourite chip of mine, and I have written about it extensively both on these pages and elsewhere. 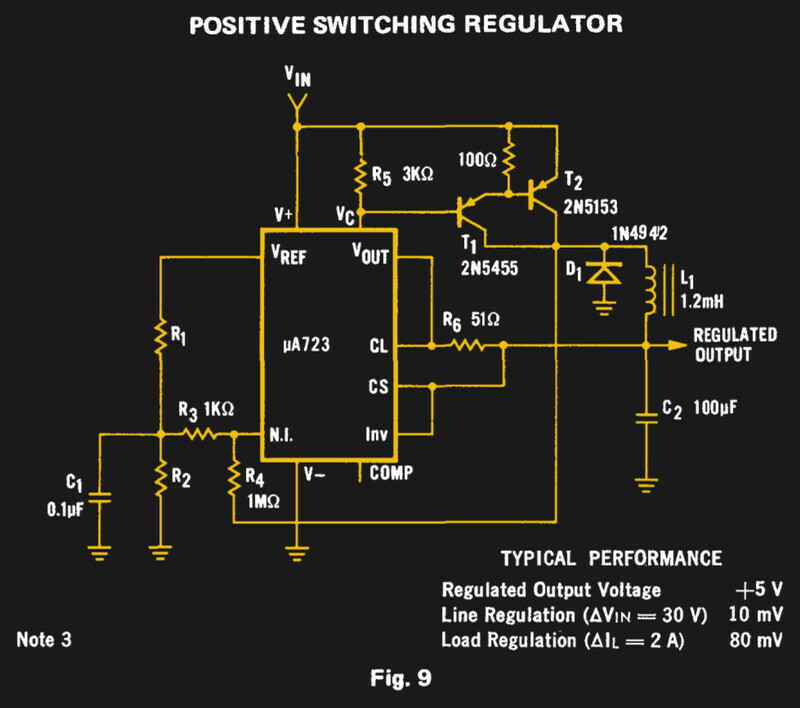 The Fairchild switching regulator circuit. From the μA723 data sheet in their 1973 linear IC databook, page 194 onwards. For all my experimenting with a μA723 over the decades there is one intriguing circuit on its data sheet that I have never had the opportunity to build. Figure 9 on the original Fairchild data sheet is a switching regulator, a buck converter using a pair of PNP transistors along with the diode and inductor you would expect. Its performance will almost certainly be eclipsed by a multitude of more recent dedicated converter chips, but it remains the one μA723 circuit I have never built. Clearly something must be done to rectify this situation. In the continuing process of semiconductor companies buying each other up, ON Semiconductor has acquired Fairchild Semiconductor for $2.4 Billion. ON Semi and Fairchild’s deal is only the latest in a long line of mergers and acquisitions. We’ve recently seen Dialog’s buyout of Atmel, Avago’s purchase of Broadcom, NXP and Freescale’s merger, and soon might see TI buy Maxim. We’re currently in the great time of acquisition, with nearly $100 Billion flowing from company to company in just a few months. Companies have cash to spend and costs to cut. This latest deal is expected to save $150 Million in annual costs. Fairchild has a long and storied history in the semiconductor industry, with the first integrated circuit produced in a Fairchild lab in Palo Alto. [Bob Widlar] made Fairchild his home until famously leaving for National Semiconductor in 1965. Somewhat ironically, Fairchild Semiconductor was bought by National Semiconductor in 1987. ON Semiconductor’s history is not nearly as interesting, being spun off of Motorola’s semiconductor business in 1999. Although ON’s main line of business was discrete components, ON also has a catalog of quite a few power management ICs. Unfortunately, because ON Semi bought Fairchild and not the other way around, we’re stuck with what is probably the worst logo in the entire semiconductor industry: drop-shadowed balls are so mid-90s! SparkFun has always been good about designing and stocking useful breakout boards. This recently added Logic Level Converter is no exception. It’s uses two BSS138 MOSFETs to shift 5V logic levels to 3.3V. The board handles two separate serial pairs. Just hook up the RX and TX on either side. 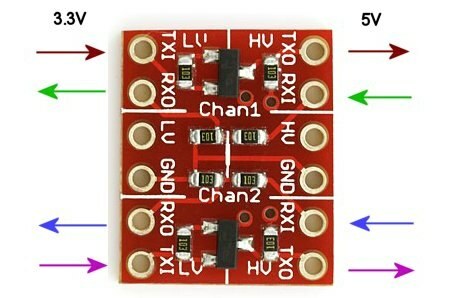 Provide power at both voltages and the board will happily do the conversion. It’s $2, smaller than the size of a quarter, and perfect for plugging into a breadboard.